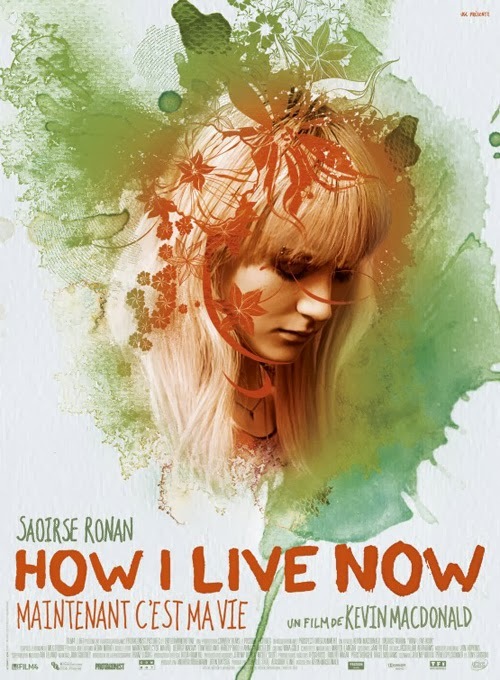 (SPOILERS) There’s enough genuine grimness in How I Live Now to nominate it as the anti-Young Adult movie. It’s probably no coincidence this is the strongest aspect of the picture, an unvarnished take on (global) conflict and the collapse of society shorn of the cosy fantasy elements of most of its stable mates. Kevin Macdonald’s post-apocalyptic Britain at times conjures the spectre of a teen Children of Men, but that’s more for its iconography (a martial, desolate and dissolute landscape) than actual content. During its best passages, How I Live Now holds the taut immediacy of plunging into a nightmare tomorrow, where everything familiar is thrown on its head. And the murky background to events is somehow more believable than any detailed geopolitical account. But the attempts to blend this with a standard issue romance are less certain, feasible as a dream to hold onto through the dark times but less convincing when actualised. This is Saoirse Ronan’s second recent attempt to anchor a Young Adult adaptation, and it’s considerably more effective than The Host. Notably, both aspire to depict the internal monologue of a young protagonist and here in particular How I Live Now is more successful. Partly because the voices are less crucial to the plot, but also because they aren’t nearly as silly. Daisy (Ronan) is a self-absorbed, uppity New Yorker sent to live on a farm with her English cousins Edmond (George MacKay), Isaac (Tom Holland) and Piper (Harley Bird). Afflicted by a chiding inner aspect mixing self-help instructions with vehement character assassination, Daisy’s temperament soon thaws when she and Edmond fall in love. But brewing in the background are international tensions and the threat of war. Soon after her aunt (Anna Chancellor) departs for an emergency conference there is a nuclear attack on London, and the cousins are cut off from the outside world. Their attempts to make a go of it alone are curtailed when soldiers detain, separate and evacuate them to different parts of the country. But Daisy hasn’t given up on reuniting with Edmond. There are some whacking great gaps in the logic of How I Live Now, credited to three writers; Jeremy Brock (who also worked with Macdonald on The Last King of Scotland and The Eagle), Penelope Skinner, and Gilliam and Red Riding Trilogy writer Tony Grisoni. I’m presuming most of these pre-exist in Meg Rosoff’s novel. But one thing I really like about the construction is how oblique the circumstances of this brooding Third World War are. On that level, it echoes 1980s nuclear nightmare efforts where the reasons for the situation are less important than the situation itself. Still though, there has to be a gesture towards joined-upedness. Would a mother, no matter how vital the circumstances, leave her children unattended when the world is on the brink of darkness? Hers is a decision that introduces a brief idyll uninfluenced by adults; Enid Blyton with added lust and mushroom clouds. Such a mismatch means it’s only the naturalistic shooting style adopted by Macdonald and cinematographer Frank Lustig that holds the fort in grounding some of the more unlikely elements. Most glaring of these is the terribly fortunate lack of radiation sickness. This is despite a cloud of nuclear ash raining on the young quartet and their consumption of poisoned food and water. The scene when the blast is heard, and then it begins to “snow”, might be the picture’s most powerful; the realisation that something terrible is happening amid a serene, pastoral setting. But at least a couple of these kids (at 16 or so, Daisy and Edmond are more age-appropriate than in the book) really should be old enough to have an inkling of the deadly effects of nuclear fall-out (who knows, perhaps it all became a bit boring post-‘80s and ignorance is bliss; yet Edmond knows enough to tell the younger ones to get inside). I won’t complain that the slow deterioration in health and faculties of When the Wind Blows is absent here, but it seems to me there’s some onus to follow through if you’re tackling weighty themes and subjects. From what we see here, you’d be forgiven for thinking Tepco commissioned How I Live Now; radiatioactivity is relatively benign and nothing to worry about at all, kids. If you don’t think about it too much, it will go away. There are also other slightly anomalous events; does Daisy have a very important dad (we know little of him, except that the father-daughter relationship is fraught)? Why else would the man from the US Embassy show up with a plane ticket (if this is happening to all US expats, this guy will do an awful lot of driving)? Understandably, Macdonald chooses not to emphasise what appears to be a relationship between first cousins (apparently the director has said this is not the case, but there’s no evidence otherwise in the movie). I don’t think this plot is wholly successful, but it works in as much as it’s Daisy’s driving force; an ideal to be pursued, to keep her going. Ronan and Mackay give solid performances, although Edmond is as burdened with affectations as Daisy (he’s a sensitive soul, picking up on thought processes and talking to the animals, like a teenage Dr Doolittle). If their reuniting is a little schematic (Edmond is now emotionally and physically scarred and distant, Daisy has learnt the importance of devotion without expectation of reward), certain narrative choices have pushed the boundaries of our expectations sufficiently for there to be no guarantee of a happy ending. This is a film where children are shot in the head and body-bagged amidst piles of decaying corpses. The countryside, once a haven of warmth and safety, becomes a constant source of danger and horror. Cadavers are strewn, rapists lurk at every turn and the only code is degeneracy and lawlessness. The towns are no safer, the target of pitched battles. Daisy may not be the most reassuring of parent-figures for poor Piper, but her fanciful goal keeps them going. Plus, the apparent selfishness of that motivation is somehow more believable than facing reality. Certainly more so than acting the feisty Ripley type. The scene where Daisy shoots two predators (one of whom is played by Ronan’s father) is much more powerful than the punch-pulling reluctant heroics of Katniss Everdeen in The Hunger Games. It was inevitable that a wide audience wouldn’t see How I Live Now, but I suspect it has greater potential for cult movie afterlife than most of its peer group. The unpalatable subject matter could have been finessed a little (and by that I don’t mean sanitised), but Macdonald achieves something more powerful than mere verisimilitude; in spite of its flaws How I Live Now resonates.